Guy McPherson is convinced that humunity will go extinct soon. Guy estimates that it will happen in 5 to 20 years time. In the video below, Guy discusses a chain of events causing several degrees warming within a few years time, including failure of the electric grid and subsequent fall in aerosols from fossil fuel burning that now mask warming, and failure to maintain nuclear power plants cooling, causing them to melt down. 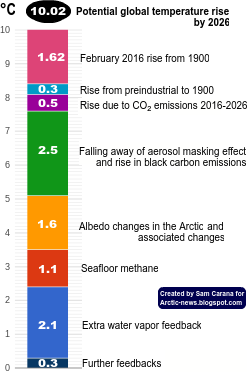 These events will cause rapid warming that will accelerate loss of the snow and sea ice in the Arctic and cause massive methane releases from the seafloor of the Arctic Ocean, both adding even further warming. 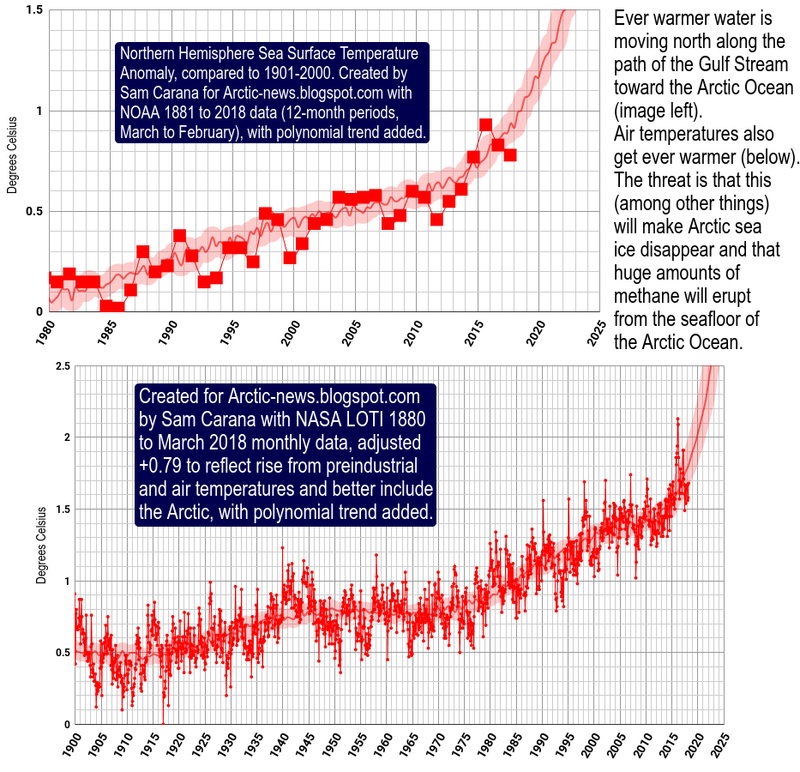 Such massive warming will result in widespread crop failure and loss of habitat for humans over a timespan of up to 20 years, while events could all unfold in just 5 years time. In the video below, Guy discusses that we are on the edge of extinction, episode 1. In the video below, episode 2, Guy describes how large releases of methane from the seafloor of the Arctic Ocean alone could end civilization, as they will cause crop failure on the Northern Hemisphere and subsequent collapse of civilization. This will in turn cause failure of the electric grid, etc., as described above. So, whatever event comes first, it will trigger the other events, resulting in several degrees Celsius warming within years and loss of habitat for humans. The image below highlights some of the complexities associated with the necessary cuts in emissions, including the impact of aerosols that mask the full wrath of global warming by half. In 2007, the IPCC described aerosols as a negative (cooling) force equal to between -0.5 and -2.5 W m-2. In 2009, Murphy et al suggested an aerosol forcing about -1.5 W m-2, reducing the net climate forcing of the past century by about half. In 2011, Hansen et al, based mainly on analysis of Earth's energy imbalance, derived an aerosol forcing -1.6 ± 0.3 W m-2. 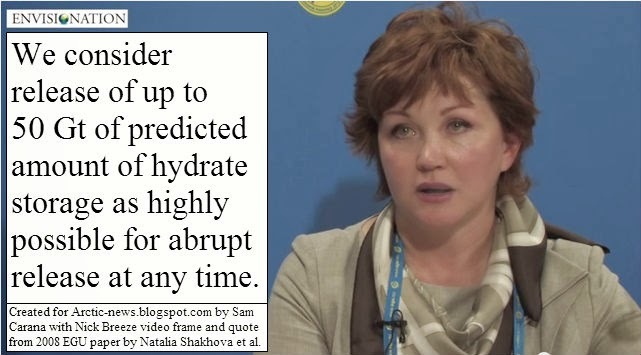 [source] As David Spratt points out, this equates to a cooling of about 1.2°C. 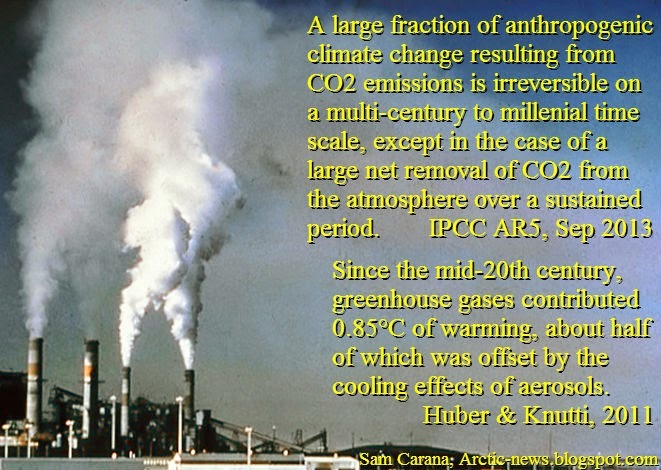 In other words, abrupt ending of aerosols emissions would result in a temperature rise of about 1.2°C in a matter of weeks. 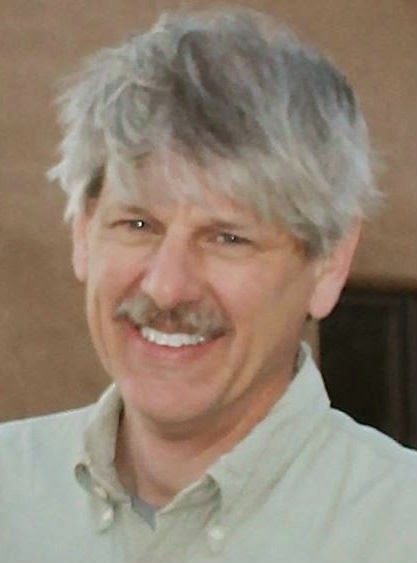 In the video below, Guy McPherson further discusses the impact of aerosols. Below, 'Edge of Extinction', episode 3, published on 15 January, 2015, featuring Guy McPherson in a fine moment of comedy! Excerpt from his presentation at Butte College, November 20, 2014, Chico, California. Below, 'Edge of Extinction', episode 4, published on 21 January, 2015, in which Guy comments on the State of the Union address of January 20, 2015. Below, 'Edge of Extinction', episode 5, published on 27 Jan 2015, featuring an excerpt from Guy McPherson's interview on Global Research December 12, 2014 on the stages of grief. 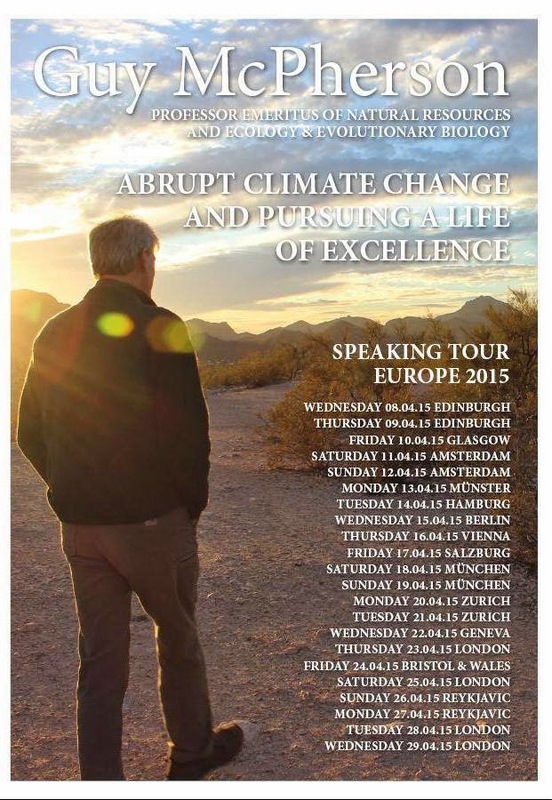 Follow Guy McPherson's European Trip March/April 2015. It amazes me that no one is talking about extincting the fault of monetary world before Earth extinction. Basically we can theoretically make a change to contract which undoes forced entropy rise of Contract. Right now there are people making globalisation plans for world contract law between nations in secret. The TPP or trans pacific partnership to prop up the corporate world and moot the little guys from table. Industrial Civilisation has capacity if given new focus, that of maximis for what keeps peace and Earth, to literally test the combined will-to = live vs the forces of physical heat rise universally. Dale, I agree. Trouble is denial. It affects more than climate change. So much easier to live if you can ignore the consequences of your actions. 1. no one with authority has a clue how to create a new model nor what it should look like. 2. the current winners' have winnings that won't count in the new model. I found this useful tool that Sam and the crew here might be interested in using. Other maps are also available and are real time data.